The points table of the 2019 IPL has turned upside down over the past nine days where the Delhi Capitals recorded three consecutive wins. In the same period, the Sunrisers Hyderabad lost three in a row. The 39-run defeat of SRH brought an end to the 10-match winning streak of the chasing teams in the IPL. 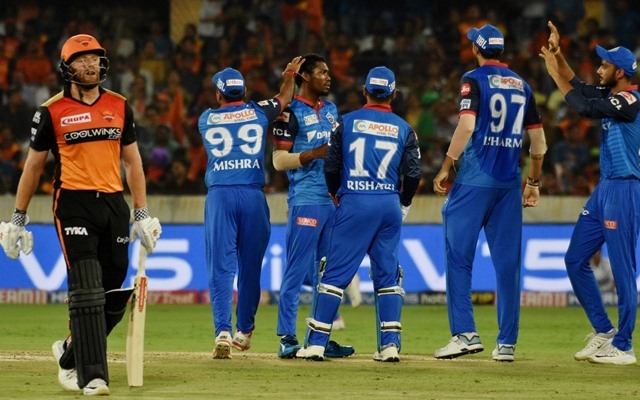 This streak began post Sunrisers’ 40-run defeat to the Mumbai Indians also in Hyderabad. They lost their last five wickets for 8 runs against MI and only made 15 runs for the last eight wickets against Delhi. The Delhi Capitals, previously named Delhi Daredevils, featured in their 100th IPL game at their home ground, Feroz Shah Kolkata in the 2014 season. They took on the Sunrisers Hyderabad in the milestone game and were defeated by 8 wickets after the SRH chase was reduced to 43 from five overs. Sunrisers Hyderabad, who made their debut in 2013, took on the Delhi Capitals on Sunday at the Hyderabad’s RGIC Stadium in their 100th IPL game on Sunday. The Capitals returned the favour by spoiling the SRH’s milestone game as they handed a 39-run defeat. Bhuvneshwar Kumar’s love with the RGIC Stadium in Hyderabad has begun well before his SRH debut in 2014 itself. The pacer dismissed Sachin Tendulkar for a duck that too in the final of the Ranji Trophy during the 2008/09 season. Thus, he remained as the only bowler to dismiss Sachin for a duck in the Indian domestic first-class cricket. In 2012, he scored his maiden FC century while representing Central Zone. In 2013, Bhuvneshwar made his Test debut in Chennai and went wicketless. However, he bounced back in the 2nd game by cleaning up his current team-mate David Warner. Later during an IPL game in 2017, Bhuvneshwar bagged his maiden 5-wicket haul in T20s and also completed 100 wickets in the IPL. On Sunday, Bhuvi picked up his 100th IPL wicket in SRH colours that too in the Sunrisers’ 100th IPL match. Shikhar Dhawan was a part of Delhi Daredevils/Capitals’ maiden IPL game in 2008 season against the Rajasthan Royals in Delhi. Dhawan scored an unbeaten 52 in a successful chase during that game. On the other hand, Amit Mishra took 3/19 in Sunrisers Hyderabad’s IPL debut game against Pune Warriors during the 2013 season in Hyderabad. Mishra was the player of the match in that game as his bowling helped SRH to defend their total of 126/6. Dhawan missed the first half of the 2013 season for SRH due to an injury he caught up on his Test debut while Mishra too missed out on Delhi’s debut in 2008. However, the duo were part of the Delhi franchise’s 100th game of the IPL during the 2014 season in Delhi, although, in the Sunrisers’ playing XI. This time around, the duo together featured for the Delhi Capitals in the SRH’s 100th IPL game. The teams involving Dhawan and Mishra won all the above mentioned special matches. David Warner, with 1403 runs, holds the record for scoring the most number of runs in the IPL at the RGIC Stadium in Hyderabad. He went past Shikhar Dhawan’s 1378 runs including the seven he made in this game. Bhuvneshwar Kumar, on the other hand, became the leading wicket-taker in the Twenty20s at this venue with 34 wickets. He surpassed Amit Mishra who has 32 wickets to his name in T20 cricket here.